Watchtower started as a service to let users know when they should change a password because it had been compromised. The feature still does that, but with 1Password 7, Watchtower does much more. Watchtower provides alerts of security breaches that may have exposed your login credentials. You’ll find Watchtower in 1Password’s left-hand sidebar where it lives in a dedicated section. Clicking on Watchtower in the sidebar expands reveals each of its components. Right at the top are ‘Compromised Logins’ and ‘Vulnerable Passwords,’ which securely compare your logins and passwords against the enormous database maintained at haveibeenpwned.com without transmitting your passwords to anyone. If a site has had a data breach that may have compromised a login or password you use, you’ll find it here. Watchtower also analyzes your database for reused and weak passwords. With 1Password and macOS’s abilities to generate random strong passwords, there’s no reason to use the same passwords on multiple sites or create short crackable passwords. These sections of Watchtower serve as a comprehensive audit of your password past, which simplifies the process of updating to strong, unique passwords if it finds vulnerabilities. These days there isn’t a good excuse for a website to not be using https for logins, but you may still have logins stored in 1Password from before https became commonplace. Those logins have a separate section in Watchtower, so you can revisit the sites and switch over to secure login pages where available. Watchtower also analyzes your logins and highlights ones where two-factor authentication (2FA) is available. Using 2FA hasn’t always been easy on some sites, so I’m guilty of having avoided it longer than I should have for some of the websites I visit. 1Password makes updating your logins on those sites easy by identifying them and improves the login process with single-use passcodes that can be generated by 1Password for iOS itself. Finally, Watchtower proactively analyzes credit cards, passports, and other items in your vaults that have expiration dates, alerting you of the need to update or replace them. Credit cards tend to auto-renew, but this is particularly handy for passports or anything else the requires you to renew them manually. Vaults are how you organize the information stored in 1Password. For example, you may want to set up a separate vault for logins and passwords that you share with someone else or create different 1Password vaults for personal and business data. 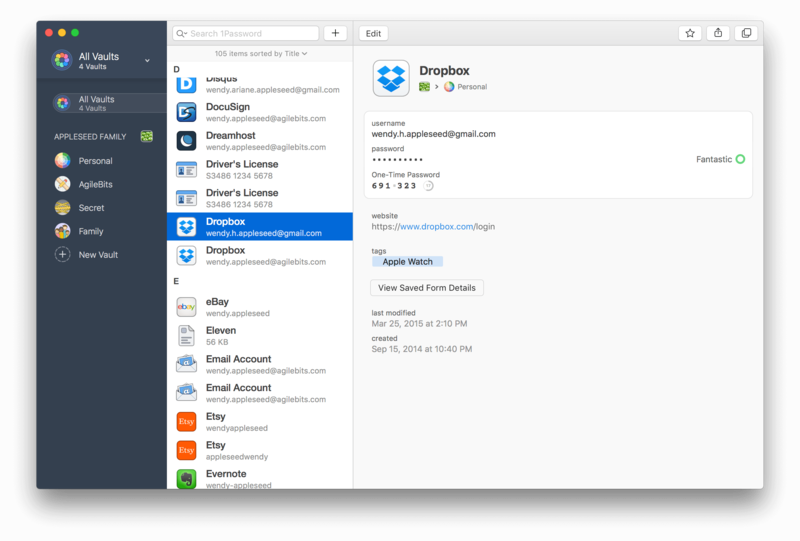 With 1Password 7, full drag and drop support makes vaults easier to manage. All of your 1Password vaults are visible in the app’s redesigned sidebar. New vaults can be created by clicking the ‘New Vault’ button, from the File menu, or by dragging an item onto the sidebar button from another vault. Each vault can be named, have a description, and an icon. 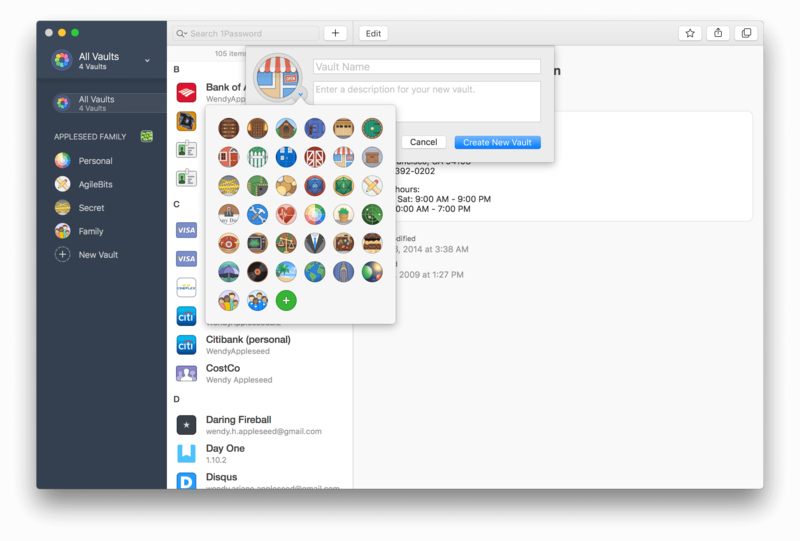 1Password has added 38 icons you can choose from, or you can drag in an image of your own. I’m not a big fan of the icons, but it’s just as easy to drag in my images, so it’s not a big deal. Every item stored in 1Password can be moved between vaults by merely dragging it from one to another. If you’d rather copy something to another vault, hold down the Option key while dragging it just as you would with a file in the Finder. 1Password 7 has improved the login process for apps too. 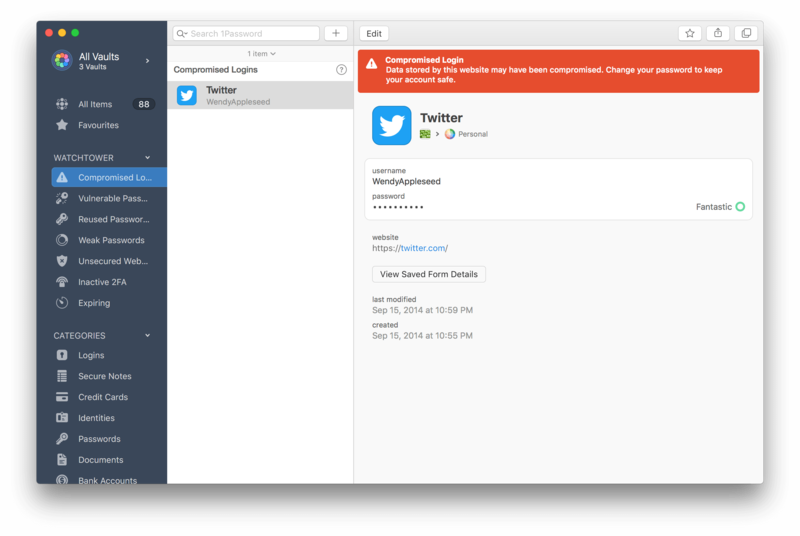 I switch email and Twitter clients a lot to test different apps, and whenever I do, it required jumping back and forth between the new app and 1Password to log into my accounts. 1Password 7 eases this process by detecting the app you’re using so when you click on the 1Password menu bar app, it’s already suggesting the login credentials to use.1 Copy and paste or drag and drop your username and password into the app’s text fields, and you’re all set. It’s not quite as easy as the ability to autofill and log into a website, but it’s a big improvement nonetheless. However, one thing I don’t like about the updated menu bar app, which AgileBits calls 1Password mini, is that it’s difficult to know how to resize and move the window at first. There is very little chrome along the top of the window, and what’s there is the same color as the window’s background providing no visual affordance indicating which parts are draggable. There are many other changes to 1Password 7 the impact of which will depend on how you use the app. However, there are so many small improvements that I expect in aggregate, they will be significant to most users. 1Password has a redesigned dark sidebar that collapses. The design of 1Password has been refreshed throughout. In addition to the features I’ve already mentioned, the sidebar now sports a dark look that looks fantastic, focuses users on selected items, and fits in well with apps like Slack, which feature a similar three-pane, dark sidebar design. The sidebar can also be collapsed to a narrow strip of icons, which is a welcome addition for users with smaller screens. There are plenty of days when I’m on my 13” MacBook Pro, that tucking away most of the sidebar makes a lot of sense. Secure notes now support rich text formatting using Markdown syntax too. Markdown text isn’t styled as you edit, but after you click ‘Save,’ the Markdown syntax is replaced by its rich-text equivalent. Password fields also feature a new typeface, which is a variant of one of my favorites: Courier Prime. The new typeface called Courier Prime Bits is designed to make it easy to distinguish between characters like a one, lower case ‘l,’ and a pipe character for those times when you find yourself typing in a password manually. Secure notes support Markdown formatting syntax. Another handy feature that’s been added to 1Password is pop-out floating windows. There’s a button in the top right-hand corner of the window (or use Command + O) that takes the content in the rightmost pane and pops it out into a floating window. It’s a nice addition for times when you have information stored in 1Password that you need to refer to frequently while working in another app. Here’s the thing about an app like 1Password: most of the time all you want is to get into and out of the app as quickly as possible. It’s a speed bump on the way to some other work you need to get done but that’s locked behind a password. 1Password has always excelled at slowing you down as little as possible whether you’re using its browser extension, menu bar app, and the main app itself. 1Password 7 goes even farther down the same path than its predecessors with features like making the app login process nearly as seamless as logging into a website, adding nested tagging and quick open features, as well as supporting macOS technologies like Handoff and Spotlight. However, although those are welcome features, the focus of this update is a little different. Greater vault flexibility and a more robust Watchtower are more about managing your passwords and other information. Both features make it easier than ever to organize your sensitive data and evaluate the safety of the passwords you create. It’s a combination that makes auditing the security of your passwords and managing things like shared passwords easier than ever and worth another look if you haven’t tried that aspect of 1Password in a while. Security is a more important part of computing than ever before. Still, nothing is more frustrating than doing the right thing by using unique, long, random passwords only to have them slow you down when you need to get something done or finding out that your super-secure password has been compromised by an online service. 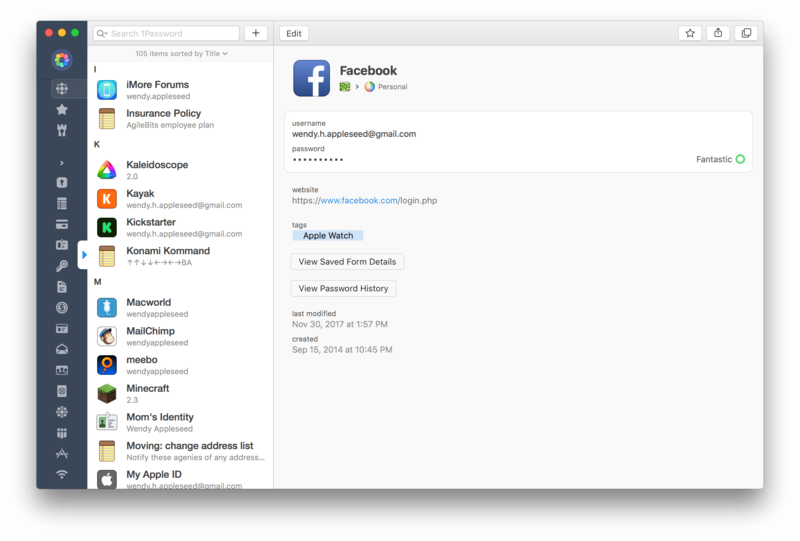 1Password 7 combines an ease of use that reduces the friction of using secure passwords with the tools needed to manage them and ensure your logins always remain secure. 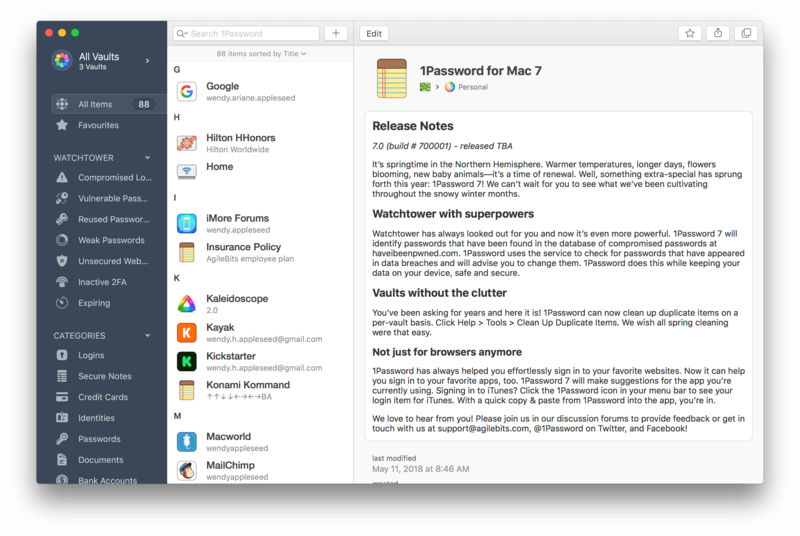 1Password 7, which requires macOS Sierra or later, is a free update to subscribers to individual, family, team, and business plans and can be downloaded from the Mac App Store or directly from AgileBits. 1Password 7 is also available for purchase as a standalone license for users who are not subscribers. Because of the difficulty of working around Apple’s lack of upgrade pricing on the Mac App Store, standalone licenses are available only from AgileBits where they are $49.99 per user, per platform for a limited time, after which they will increase to $64.99. The update is also free to anyone who purchased a standalone license after March 27, 2018. 1Password 7 for Windows will be available next week.